As soon as you have known your NYSC posting through your call up letter and you are heading over to NYSC Camp to heed the Clarion Call? There is a lot of important things you have to take along with you, on your way to NYSC orientation camp. We have compiled a list of essential things you need to take with you to camp aka “NYSC camp requirements” also Included are some life-saving TIPS! As you prepare for the orientation camp which you have been deployed to, for the 2018 Batch ‘A’ Orientation Course starting this month of April, 2018 here are the essentials! First off, the requirements. These are compulsory and you will not be allowed into any NYSC Camp if you don’t have them with you. CALL UP LETTER: This is a vital part of camp registration and it’s the only evidence that you are a prospective corps member (colloq. Corper, or Otondo) and you are not impersonating anyone. They will collect it from you and not return it, so don’t panic when this happens. You are not allowed to forget this under any circumstance, even if you forget your luggage never forget this. Hack1: If you happen to choose the print online @ N3000 option then ensure the café has laser printers and not inkjet. Why? Because documents printed with inkjet are more susceptible to water/moisture damage. Just to be on a safer side because you never can tell what may happen on the road or in camp. You are advised to do this with any document you intend to keep for a very long time. If you can’t find a laser printer, then you can use anyone. Hack2: NO MATTER WHAT YOU DO, NEVER LAMINATE YOUR CALL UP LETTER! Can we emphasize its importance any better? Protect it like it’s your life cos it actually is, for the meantime. You will most likely be sent back if you forget yours. If you mistakenly laminate yours, really your fate is shaky, you may be sent back or pardoned after hours/days of begging. In order to avoid all these unnecessary stress, ensure that you make enough copies of this letter before heading to NYSC camp. CERTIFICATES/LICENSES: For Doctors, Pharmacists, Nurses & Lab Scientists, take along your proof of certification. Graduates of Medicine and Pharmacy are expected to have their Certificates of Registration with Nigerian Medical and Dental Council of Nigeria (NMDCN) and Pharmacists Council of Nigeria (PCN) respectively. 31. CASH: Extremely important. You would need about N20,000 minus transport to and fro camp. Then between N30,000 – N40,000 to be ‘just’ comfortable. For those that can manage, say about N15,000. There are lots of things that take up money. Things like food (for those who don’t intend eating from the camp kitchen), energy drinks, recharge cards, charging of electronic devices, laundry, pleasures e.t.c. Follow me on Twitter @_NYSC for Updates 24/7! This post has been culled from 2 blogs. I’ve also included some tips. Reblogged this on dyuran4's Blog. The orientation course for batch B 2013 corps menbers ends on the 16th july,2013. 10ks u a million….d passport wot background colour is needed? A red background. I’ll update the post to reflect this. Thanks. Thanks for the awareness God bless you. It’s not necessary. Trust me. Except if it’s inevitable you have it with you for the three weeks. You can keep it with Security/Admin. For those of I that are good drinkers ,trust me u need like 50k And more in other to keep u going. Please what r the nysc camp requirements for nigerian trained doctors? Love this so much.many thanks.bt is dere any specific background for d passports?? Hahahahaaaaa, bro this is actually interesting. Thanks for the advice. Bless you!! Think this is definitely interesting n cool. Bless you!!!! Tnks a grt deal 4 d info & guides. God bless & keep u 2 continue wit ur gud deeds. How do i know where am posted thrgh my call up number so i can request for change as a married woman? Thanks a lot. Your write up is good and encouraging. Keep it up. Thanks a million times for the info n guide steps, may God bless you. Thanks very much for the comprehensive list,God bless you for this awareness. Thanks. Now am set and good to go. This is superb. You guys are awesome.Thanks a bunch. Thank you very much God bless you dear. I’m not really sure on that one. I think, I think as long as the child is still being breast fed, the mother should be eligible to relocate. Reblogged this on Abdussalam Amoo's Blog. You say final year school ID card is needed, what about those that don’t have ID cards Bcos the school never made provisions for it? Also, you mentioned paper. What kind? Is it normal A4 plain sheets? Or foolscap paper? Just plain A4 sized paper. Wow this is super kool,tanks ne God bless u. No. Once you’re registered, you are advised/allowed to redeploy back to wherever you’re coming from – that same day or the next. Although I don’t know the age range (of the baby) that qualifies you as a nursing mother. My baby will b 10 months old soon. Is it possible to be exempted from camp because of medical/physical challenges? Yes. Someone in wheel chair was sent back. How could you possibly camp in wheels? What if you don’t have you final year student ID card, rather, an ID card from the penultimate year, would you still be registered? Yeah. Probably. My ID card the school made for our clearance indicated no year. Pls you said somrthing about the staplers that one can bring but u noted it will be seized.don’t understand that part. Also can one bring hangers to camp? Yes, plastic hangers. Do take your stapler along although they MIGHT be seized based on reports from some camps. You should know that the level of strictness varies across the country. tnks for the info. my baby will be 7 month by may,will i be allow to stay in camp with the baby? Wow i love this information. Tanx alot. Plz is any tin wrong if i put my cash in my waist bag when i get to camp 24th of this month? Nothing is wrong with that but if your travel bag is very strong, you can split your money. About the passport I was told that it is white background like the type we used 2 register 4 NYSC nd I Hv gotten about 18 or more copies. Should I still change it with 1 of a red background? Unnecessary Things People Take To Camp | Corpr. Addresses of All NYSC Orientation Camps | Corpr. Batch ‘B’ 2014 Call-Up numbers released. #NYSC | Corpr. 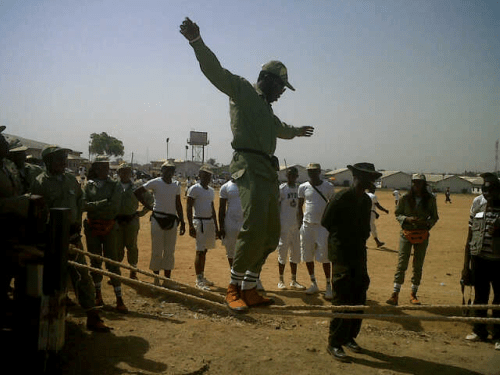 Unnecessary Things People Take To #NYSC Camp - Corpr. Batch 'B' 2014 Call-Up numbers released. #NYSC - Corpr. Addresses of All NYSC Orientation Camps - Corpr.